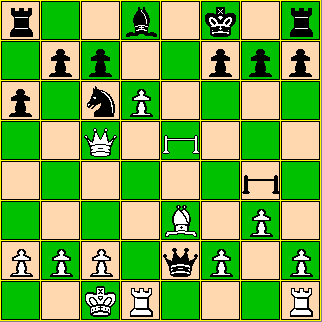 This is a rather modest variant introducing one unorthodox piece, called a Trampoline, not found in usual Chess. The rules are the same as those for usual Chess, except for the rules concerning the Trampoline. Each player has one Trampoline, which begins off the board. A player may use his turn to drop his Trampoline onto any vacant square. This rule continues to apply after the Trampoline is on the board; i.e., a player may use his turn to move the Trampoline to any vacant square. The Trampoline cannot captureâ€”it can only be moved to a vacant square. Neither can a Trampoline be captured. 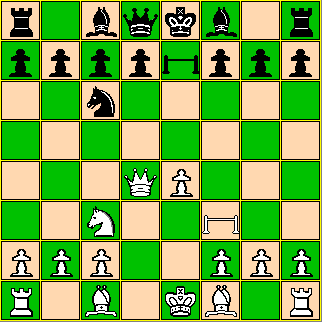 Although no piece can occupy the square where a Trampoline is located, the Trampoline does not block the sliding movement of a Bishop, Rook, or Queen. A Knight can also jump over a Trampoline, just as it can jump over any other piece. 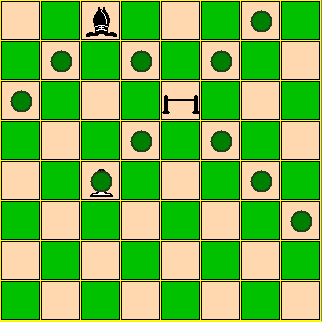 A Pawn cannot occupy the Trampoline's square but it can make its initial doublestep move through a square occupied by a Trampoline, on the third rank (for White) or the sixth rank (for Black). 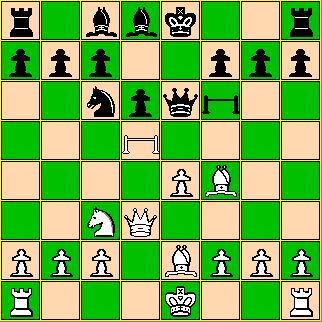 However, the King and Rook cannot castle through a square occupied by a Trampoline. Although no piece can move to the square where a Trampoline is located, any friendly Bishop, Knight, Rook, Queen or Pawn (except on the Pawn's initial doublestep move) that would normally be able to move to that square may instead move immediately to any square whither it would be able to move if it were starting from the Trampoline's square. Conceptually, it can leap onto the Trampoline and immediately bounce off onto a second move. 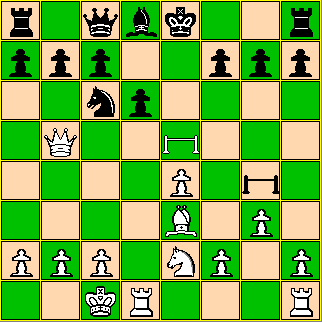 However, the move must change the board, so the piece must move to a square other than the one where it started, except as noted below. Note that a player cannot use the enemy Trampoline in this way. Also note that a King cannot use the Trampoline. 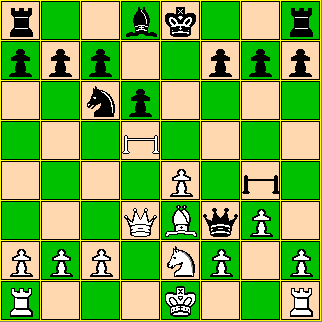 If a friendly Trampoline occupies the square on the last rank whither a Pawn could move and promote, the Pawn can promote as in usual Chess and bounce from the square as whatever piece it promotes to. 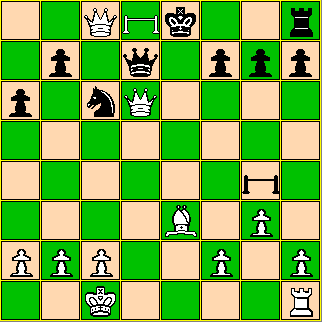 In making such a move, the promoted piece may return to the Pawn's starting square: this is the only instance where a Trampoline-enabled move can so return to the original square, and it is allowed because the move changes the board (the piece returning is no longer a Pawn). If you have Zillions of Games installed on your computer, you can play this game. Download file: ZRF.zip. The Trampoline could be represented by a checker. Here is a game played by Zillions of Games against itself, set for 30 seconds of thinking and moderate variety of play. Both sides drop their Trampolines early to develop their Queens and their Knights. Zillions seems to have taken care not to allow the Trampolines to interfere with normal Pawn development; White's Pawn on f2 can still move to f4 because Trampolines do not block Pawn doublesteps. 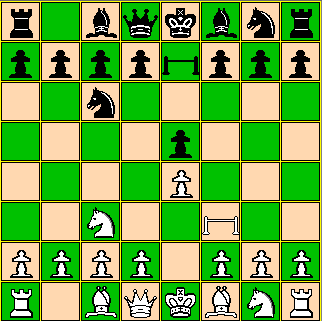 The first Trampoline-enabled move: Knight at g1 takes Pawn at d4. 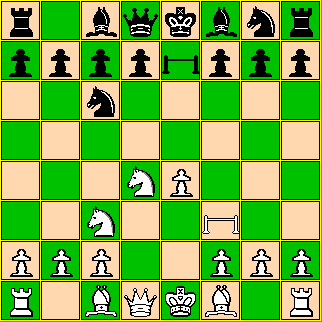 The second Trampoline-enabled move: Knight at g8 moves to c6, forcing the White Queen to retreat; but she retreats to a square whence she has much more power, due to her Trampoline. Black uses Trampoline to move his Queen out. White relocates his Trampoline for the first time, enhancing the power of his Queen and Knight. Black will reply with a Trampoline-enabled move to relocate his Bishop to the other side of his unmoved King, perhaps planning to castle. ... and again, to pressure the Pawn at g2. The Trampolines are used a lot in the next several moves. After White castles, Black's Queen uses two tempos to retreat to a square she could have reached in one: apparently some danger came into Zillion's focus after White's move 16. By moving the Trampoline, the White Queen gives check while still pinning the Knight that could have interposed. 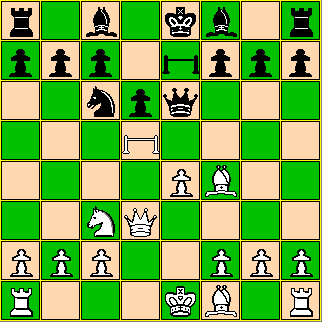 Black then gives up his right to castle; why didn't he interpose with his Bishop instead? Then, White makes a Trampoline-enabled pawn capture. Black's Trampoline-enabled capture of the remaining White Knight tips the material balance in his favor, but his fate is already sealed. It seemed to me that the Trampoline affected the game to just the extent that I had hoped: it becomes a strategic focal point but doesn't make everything else irrelevant. It may enhance the power of friendly pieces so much as to make the Queen too dominating; perhaps a variant on the variant would be to demote Her Highness back to a Ferz. Postscript: Alfred Pfeiffer points out in the comments that Joao Neto's earlier game Hop Chess is similar to Trampoline Chess. The major differences are that players can use the enemy Hopper (equivalent to the Trampoline here), and players move both a piece and their Hopper each turn. I don't remember reading about Hop Chess before now but it might have been in my subconscious when I thought of Trampoline Chess. I should also add that it was my brother, John L. Thompson, who suggested that the Trampoline should not interrupt the sliding moves of the Bishops, Rooks, and Queens, lest it turn into a defensive piece. WWW page created: December 2, 2009.